After trying Ballast Point’s Watermelon Dorado last week, I fell in love. So naturally, when I saw another Ballast Point beer featured at the head of the aisle at Old Line, I didn’t hesitate to pick up a six pack. In short: Yes, I taste the grapefruit flavor over the typical IPA taste (7% alc), but I am now trying to finish it so I can go grab another watermelon. 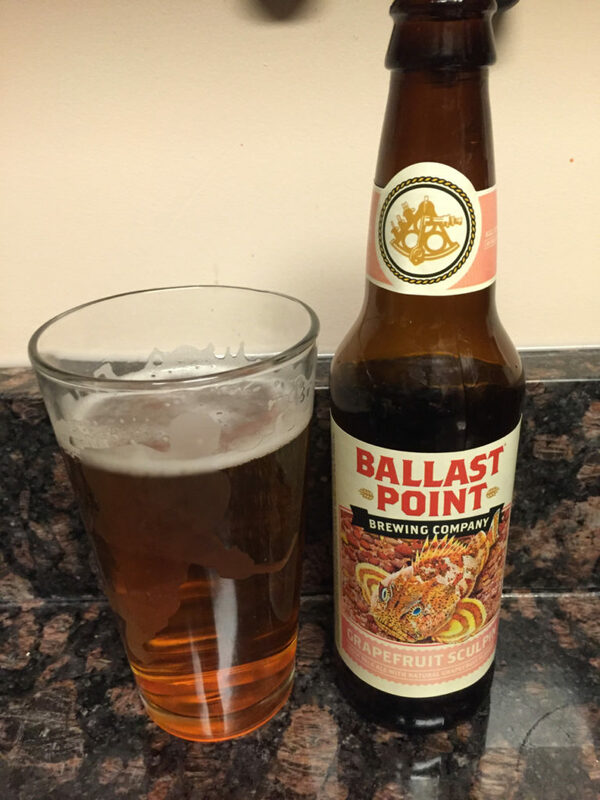 Ballast Point does a good job making the distinct taste (unlike some beers that are, for instance, ‘peach’ but taste like bark). That said, at a fruit buffet, I’d be more likely to pile my plate with watermelon over grapefruit, and same goes with these beers. I haven’t tried the Pineapple yet (Justin liked it), but can’t help but think it’s too much different. Maybe I’m wrong. I’ll give the grapefruit 2 out of 5 stars, but if you really like grapefruit you’ll likely love this.